After the dud that was EA’s press conference, which sounded like they were speaking to investors rather than the people who will actually be buying their games, the ball was in Microsoft’s court to pick things up and kick off E3 right. And damn did they deliver. Right off the bat we got a gorgeous teaser for Halo 6 a.k.a. Halo Infinite and the train just kept on going. I loved everything I saw and I’m looking forward to the rest of E3 now. However, two things left with mixed feelings. Let’s start with the first game Microsoft showed: Halo Infinite. 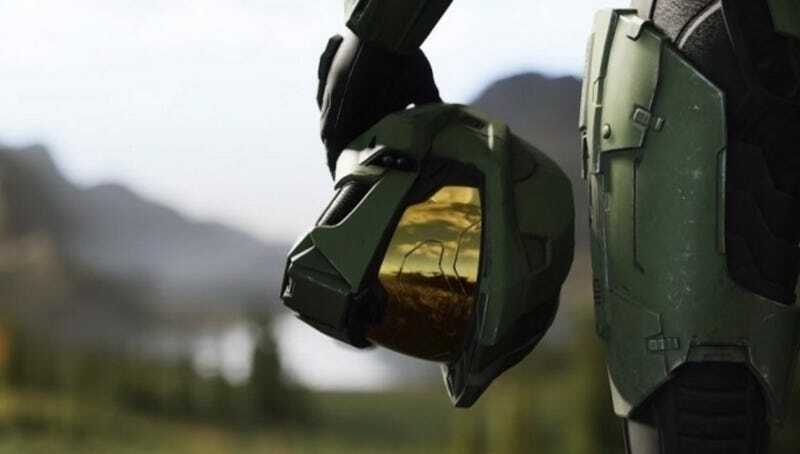 Built on 343 Industries brand new Slipspace Engine, Halo Infinite is the next chapter in the Halo saga, picking up after the end of Halo 5(Eagle-eyed viewers spotted a date on the downed pelicans dash: May 27th, 2560 which indicates the game is set a year and a half after Halo 5 and a little over a year after Halo Wars 2.). It is coming to Xbox One and PC, it will have a multiplayer beta, it will have an art style that leans more towards classic Halo, but with some differences, it will have split-screen and LAN support, and the story will focus far more heavily on the Master Chief than Halo 5 did. However, we don’t know when it’s releasing, we don’t know what it looks like in motion(The trailer was in-engine, meaning that it can achieve that level of graphical fidelity, however in motion they may not be able to achieve that look due to technical limitations. ), we don’t even know what it will be like gameplay-wise. It’s been almost three years since Halo 5, and mainline Halo games have typically taken three years between releases with the one oddball case of Halo 4 which was in dev for a little over two years. However, 343 Industries has applied that they’ve spent a large chunk of the last two and a half years building the new Slipspace Engine, which tells me that the game itself is not that far along, and they said as much in post-conference statements, suggesting that the game is not yet in a showable state and that it will be some time before it gets there. This trailer was more about putting the game out there, getting people talking, and keeping Halo in peoples minds. Not necessarily a bad thing to do, but now you’ve starter a hype train with no guarantee that you’ll put anything else out there in the next 6 months. The prevailing theory right now as to what the title “Infinite” means is that Halo Infinite is not JUST Halo 6. It is Halo 6 & beyond, a platform for all future Halo content. New campaign missions, new multiplayer maps and modes, constantly added over time like any other service title, except that we’ll never have to wait for Halo 7, it will just be a continuous stream of Halo story and multiplayer year after year. And if true, would speak volumes about their confidence in this product and that it’s the definitive Halo experience that they believe fans have been begging them for, because the multiplayer will be set in stone post-launch, and if they plan for this to be the final destination of everything Halo, they won’t be able to easily change that if it gets a negative reception. And then there’s Gears of War 5. I had a feeling this one was going to be announced, and I knew it was gonna land in 2019, 3 years after Gears 4. However, the reveal trailer left me with a serious case of confusion. Gears 4 ended with a budding relationship between a young James Fenix and Kait Diaz, the latter of which was seemingly related to the Locust Queen, Myrrah. The threat of the Swarm was growing and they’d soon have to face the evolved horde. And yet, far as I can tell, Gears 5 picks up years after Gears 4, everyone has aged and changed dramatically. Marcus is about the only person that seems consistent. The relationship between JD and Kait has seemingly fallen apart, JD is now a bit of a prick, and apparently he has an arm that looks like he’s going Swarm somehow. And now, apparently, after all these years, Kait has seemingly finally decided to find out what her necklace really means, who she is. And that’s the other bit of whiplash. The protagonist of this new Gears saga has shifted from JD to Kait. The problem I’m having with all of this is that there has apparently been a timeskip greater than any of the past Gears games(Save between Gears 3 and 4.) and in that time a lot has apparently happened, but we’re given this trailer with zero explanation for any of it. We’ll likely get that explanation later, but as a way to show off the new installment, it’s confusing. As for choosing Kait to be the new protagonist, taken in context it does make some semblance of sense. We were eventually going to have to learn her true nature and place in the larger Gears narrative, and putting her in the lead for that journey makes a lot of sense. But from the trailer, it seems like we’ll be leaving the previous protagonist, JD, behind as well as series vet Marcus, but Del will still be along for the ride. It makes sense from a cooperative perspective to have a second character along, and given the change in relationship between JD and Kait, it makes sense that JD wouldn’t be the one to go with, but it really puts any romance between them on ice. It’s a very jarring return to the Gears series, and that’s alongside an X-COM-esque tactics game and a mobile game based on Funko Pop figures. Those were honestly my two head scratcher moments from the Microsoft conference. I may be disappointed in the setting of Forza Horizon 4, to the point where I may not even get it, but at least I’m not confused like I am with Halo and Gears, even if I’m sure everything will be cleared up given time.